How Much Gold has been Mined in the World? If you are in possession of any gold earrings, necklaces, bracelets, or even bars, you may want to start taking stock. Jason Notte raised an interesting question on MSN’s moneyNOW last week: If you could collect all of the mined gold in the world into a single pile, how big would it be? If you’re picturing skyscrapers or mountains, the answer might surprise you. It’s hard to determine exactly how much gold has been mined to date, because illegal mining is a legitimate problem and there’s no telling how many bars private investors have stowed away. 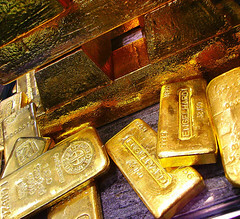 But the good people over at Thompson Reuters GFMS do their best to assess the situation every year, and they recently released their 2012 gold survey. According to this most recent survey, they estimate that there are 171,300 metric tons of gold in the world. But the Gold Standard Institute places their estimate higher—much higher. They claim that there is currently somewhere between 1.2 and 2.5 million metric tons of gold in the world. If the more generous estimate were true, that would be enough to cover Centre Court at Wimbledon with a towering stack of gold that is 469 feet high. The discrepancy between the estimates made by Thompson Reuters GFMS and the Gold Standard Institute boils down not to the amount of unrecorded gold being mined in the modern day, but to the amount that was mined prior to the 1848 California Gold Rush. The standard estimate, which has been formed under the assumption that gold-mining processes would have been less efficient in the past, is that 10,000 metric tons of gold had been unearthed by 1848. But the Gold Standard Institute speculates that gold would have been much more abundant and accessible the further back in time you go and have raised their estimate accordingly. Supporting this theory is the fact that over 1.5 metric tons of gold were found in King Tut’s tomb alone—and he wasn’t even a very important pharaoh. Regardless of how much gold has been mined to date, the US Geological Survey places the amount of gold yet to be unearthed at around 52,000 metric tons. In any case, each of these estimates is just that: an estimate. There is no feasible way to determine exactly how much gold has actually been extracted, and it’s likely that more minable gold will still be discovered. While the amount of gold in the world may be uncertain, one thing is for sure: If you own any gold jewelry, watches, or coins, you can send them to Cash for Gold USA and receive cash in return. We cover the cost of shipping, assess the quality of your items, and then put your check in the mail. It doesn’t get any easier than that.